Question 2 – Why is this such an expensive project, and could we do something better and cheaper? Hickley Point is staggeringly expensive. So much so that the Chinese Government is being leant on to pay for it, and the financial head of the operators (Electricity de France) resigned as he says it’ll make EDF go bust. It’s costs are generally estimated, currently, at being between £20billion and £24billion. But that goes up every 6 months by abut £2billion. And not a single sod of earth has been dug for it yet. My finger in the air best guess – £40billion by the time it’s built. That is, by a large margin, the most expensive building on the planet. However, complex international financial instruments bore me. So let’s poke the engineering reasons for this. It seems this is basically down to the technology we’ve gone for. We are now in the era of 3rd generation nuclear plants. Chernobyl, 3 Mile Island, Fukushima were all 2nd generation (and early 2nd at that). In the years since those reactors were designed some pretty major steps forward in design and safety have been made. 3rd generation designs have a very big focus on containment, and on redundancy, and fail safe features. Almost all reactor designs these days use water as the cooling medium. The nuclear fuel gets hot, heats up water that’s flowing over it (there’s a barrier between the water and the nuclear fuel, but the water does become radioactive) and that hot water is used to make steam to spin turbines, either directly or after it’ been used to heat up other water in a heat exchanger. The two main varieties of design are boiling water (BWR) and pressurised water reactors (PWR). In a boiling water reactor the hot water that’s been through the reactor itself boils into high pressure steam, and that spins the turbines. The turbines are themselves exposed to radioactive steam, so they need to be inside the shielded part of the power station, and there are restrictions on access. On the other hand, this simple loop does mean there are fewer parts to go wrong. Fukushima was a boiling water design. When the tidal wave hit the reactors were shut down, but the wave damaged all the backup power supplies, and even a shut down reactor generates a lot of heat. With no power to keep cooling water moving, the water inside got hotter and hotter until it boiled once more, and then it kept heating up, until the steam was split into hydrogen and oxygen. The damaged reactor buildings at Fukushima. The reactors cores inside melted down after the emergency cooling systems failed. As the water boiled off it turned to steam, then further heating turned it into Hydrogen and oxygen. With no functioning safety systems the engineers tried to safely vent this, but the explosions were inevitable. This had to be vented (high pressure hydrogen and oxygen in a nuclear reactor core is not good). 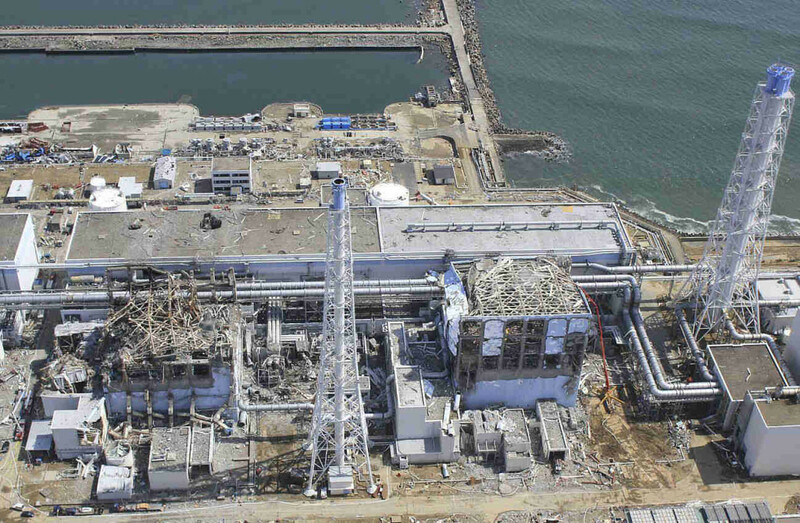 It was during this venting process, managed from a crippled control room, that the hydrogen exploded as it escaped, blowing the roofs off the Fukushima containment buildings, and releasing huge amounts of radioactive steam across the Japanese countryside and towns. Boiling water designs today have incorporated many safety features that would make a disaster like Fukushima far less likely. In the UK we are also fortunate enough not to face the threat of tsunami either. A BWR design is under consideration for a site in Wylfa on the island of Angelsea, and at Oldbury just along the River Severn from Hinckley Point. The design of this reactor – the Advanced Boiling Water Reactor or ABWR – has been used in a few locations already around thew world. Notably, it’s been delivered on time and on budget too (that’s been a huge issue for the design suggested for Hinkley Point). However, boiling water reactors have not been operated or built in the UK before – we’ve had gas cooled, and lately pressurised water reactors. Boiling water reactors are, well, weird. They give me the willies. Radioactive steam to my mind needs to be kept in a reactor space, and nowhere else. Maybe we’re getting away from pure engineering principles, but the combination of having water boiling of to steam in proximity to the nuclear fuel, and that steam radioactively swirling around turbines and condensers is just a tad too cavalier for my liking. I prefer coolant for the fuel to be in a simple circuit, undergoing no phase changes, and handing off it’s heat to a secondary, non-radioactive coolant before it goes near any machines needing regular manual maintenance. A Pressurised Water Reactor in other words. PWRs have been around for ages. Every nuclear submarine ever has used them, and they hardly ever go wrong. 3 Mile Island was one glitch, and in fairness they do have to be very well engineered (the water wizzing round the reactor is at a very high pressure). But, they’re well understood and reliable and have been evolved over 50 years in pretty stringent environments. A few modern designs are available for these, and some are well regarded. The one suggested for Hinkley Point isn’t one of them. Its the EPR. And it’s a dog. 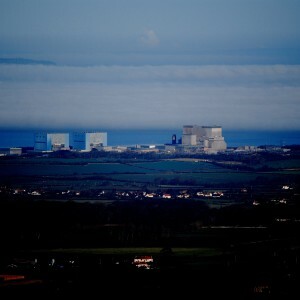 Within the industry the design proposed for Hinkley Point has a pretty poor reputation, and many independent analysts suggest it’s only being proposed for political reasons. France is desperate to retain a new reactor design capability, but every one of the EPRs proposed to date have been dreadfully delayed, horribly over budget, and most have in fact been cancelled, or switched to a different design. The main problem seems to be that the design was not very mature when the first reactors were being built, and there was a new round of safety standards coming in at the time. As the design has been adapted to account for lessons in construction, and updated guidance in the wake of Fukushima, it’s ended up being a hotchpotch f half defined components and not really a design at all. More like a big bucket of change orders. Some critical architecture features, previously core to it’s efficiency, such as fully integrated safety and control, are now considered highly undesirable, and would probably be removed in a UK build. How much would that cost……? Yeah you see the issue. This though is the basket into which the french national civil nuclear industry has placed all its eggs. So, they are willing to bet the farm (or at least their nationalised electricity generating utility) on getting it built and successful. Yay, UK energy policy as a tool for propping up french industrial capabilities! Vive l’entent cordial! Hmm. So what works, is cheaper, is available, and isn’t a weird boiling thing that frankly I just can’t even think about without shuddering. Glad you asked. The Westinghouse AP1000 is about right it’s a bit newer than the EPR, and was designed for lots of passive safety features, for two reasons. Firstly cost – the AP1000 was designed to be less complex and cheaper to build and run and keep safe than designed of 20 years ago. Complexity drives costs through the roof, so simple passive safety is a huge bonus. Secondly passive safety is safer safety. The more you rely on active systems stepping in to prevent problems, the more points of failure a system has. Cutaway of the Westinghouse AP1000 reactor design. Lots of innovative passive safety features. And 4 are in build and on budget and schedule in the USA. So is this a panacea? Well not quite. It has been proposed for a site near Sellafield (that benighted strip of the Cumbrian coast) but before it can be approved there it has to have 51 design revisions to meet standards. However, these are adjustments to a simple, proven design. They’re about how thick the extra concrete on the outside has to be. Not fundamental cooling system reworks. Or a total strip out and redesign of the safety and control software. 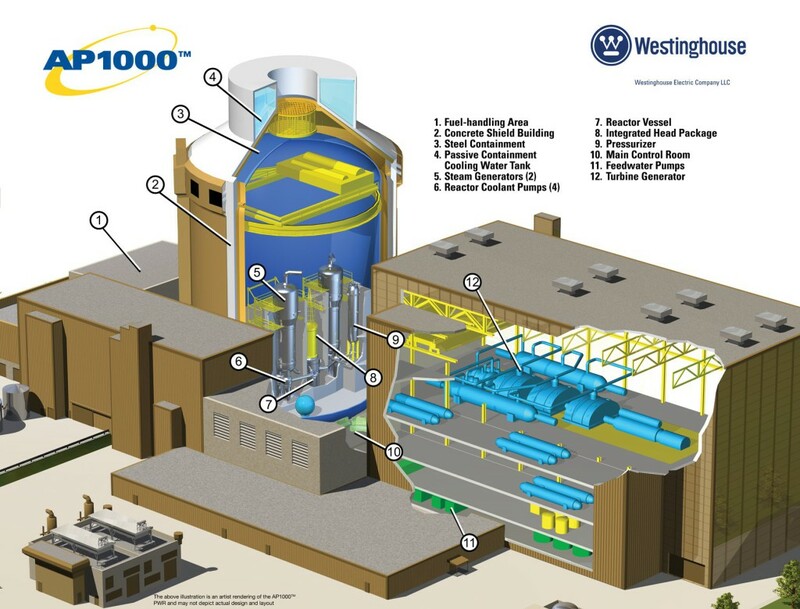 If you want a good modern commercial nuclear base load plant the AP1000 is probably it. There’s no massive subsidy available from the French or Chinese though. Sorry. In conclusion? Well I have only skimmed this subject to be honest, but the steers I have had by the nuclear industry experts I could talk to plus my own research suggests that the Hinckley Point plan is a bad one, propped up by national pride and iffy politics. If we are going to have one last round of base load nuclear power plants, the EPR really shouldn’t be part of it. It’s less than great engineering bootstrapped by fly by night finances and politics. A bunch of AP1000 would be better for us, and hopefully leave enough cash and political capital available to tackle the nuclear waste problem. The big question, should Hinkley Point C go ahead? Like it is? No. It’s insane.